We think that the easiest way to find your way around a city is to choose a centre point and then divide the city into smaller districts. For Bath our centre point is the Roman Baths on Abbey Churchyard. From here you can get to anywhere in the city centre within ten minutes. We have divided Bath into easy to find districts, and each district is divided into smaller chunks too. 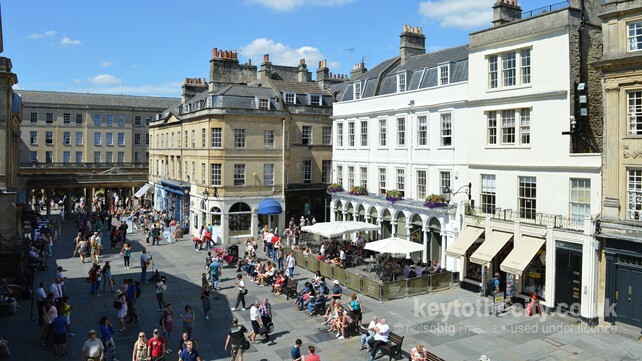 The areas are: the City Centre, compact and including the main attractions of the Roman Baths, Bath Abbey and Thermae Bath Spa; the Inner City, home to Bath's Royal Crescent and Georgian grandeur; Bath Suburbs, the city's outskirts; and finally Bath District, the outlying villages of the city. This area is great for shopping and evenings out. Parking is limited and can be very costly. At weekends (and weekdays during the university term), the city centre streets can be a noisy place with clubs open until early in the morning. Just outside of the city centre is Bath's business and residential areas. The Upper Town is home to the famous Royal Crescent and Circus and can be found north-west of the city centre. The flat plain of Bathwick, home to Great Pulteney Street, is another area to explore. The suburbs of Bath include Lansdown in the north - location of the racecourse, Twerton in the west - good for visits to neighbouring Bristol, and Bathampton and Claverton in the east. Map showing our centre point for Bath. Use the links below to view Bath on popular mapping websites.